Make sure you sign up for The Old Schoolhouse Holiday Freebie. Just follow the link. They have the best freebies! I have been fighting a sinus infection for two weeks now. Yesterday I went to an urgent care and the Doctor couldn't decide if I had a sinus infection but decided it was probable and gave me a perscription for Zithromax - the only antibiotic I have yet to have an allergic reaction to other than Cipro which they only like to use in emergencies. Today I feel a little better but not much. I feel like I'm on a merry go round I'm so dizzy. It's taken me this long to get organized enough to do school. It being a Monday there's very little chance Dh can come home early. I figure we'll do as much as we can and plug away at it the rest of the week. The weather has at least cleared up - even if it is hot. It is supposed to cool off and tomorrow should be lovely. The Spider Lady is quite happy with this turn of events and has her web all ready to catch her next meal. Next year I've resolved to take a trip. Just me to either the state homeschool convention or the Typeamom conference (if they have it in Asheville again) Last year I went to some TEACCH trainings. I think it's important for me to go to things where I can get new ideas. Another week of homeschool done. I'm very proud of the boys for not shirking their work. They've worked hard and are making progress. Things are so much easier since I got more organized. And NC Learn as well. I discovered tagfoot last week thanks to a link from Jimmie's Collage and am trying to edit the tags so I can make my links public. 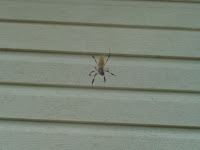 I'm still watching our spider lady in my kitchen window. I'm going to miss her when she's gone. It poured rain here last night. I watched anxiously for my not so little spider. I was worried she'd drown. This morning during a lull in the rain she was still hanging - looking very still. I was worried but something told me she was just waiting. And she was. The sun came out and she daintily respun the damage to her web. A small jewel spider next to her was spinning madly but she carefully and deliberately made repairs to her web. Middle called out to me around supper time. I walked over to find she her patience paid off. A huge horsefly had landed in her web and she and her tiny mate were having their dinner. to The Old Schoolhouse magazine. This is usually a $25.00 subscription but by using code FB795 you can get a year's subscription for just $7.95. This offer ends at midnight PST on Sept 22 so hurry over and get yours. I got my subscription last night. Just click on the link below. So it's raining here and it wouldn't let up enough to take a nature walk. It's not nearly as bad as the flooding in Georgia and points west so I'll not complain. Middle of course gets excited when she grabs a beetle or fly to eat. He likes to watch that. I just like watching her. I'm going to miss her when she leaves but she (or one like her) will be back next fall. She's become part of my routine. While I wait not so patiently for my morning coffee to ding in the microwave I stand and watch her at the window and marvel at one of God's creations. So maybe we just took our nature walk at our window? This is the Golden Orb Spider and we have eight females and probably 8 males that have taken up residence around our home and yard. They come every year in late summer/early fall. Today we started a new part of our homeschool - a daily nature walk. Two boys loved it - one is still shrieking that he's itchy from being outside. Our yard is also home to 19 jewel spiders, 7 garden spiders and one birds nest - apparently abandoned for the winter. Tommorrow we are going to take a leaf from each of our trees so we can look up and identify what we have in our yard. The two older boys are estatic about this latest addition to our day and I like it too. After we've exhausted the yard we'll be going around our area. We are in a great area for nature study. In a fifteen mile radius we have ponds, river, estuaries, marshes, and oceans. We'll try to post something from each of them. I am not pleased with myself this morning. We are on day 15 of our new school year and so far it's gone really well. Until this morning. You know the type. You wake up with a sinus headache that makes you want to pull your head off. The weather outside is simply gorgeous so this means the kids really do not want to dig and do their work. Well two of them don't. And you forget that each of them comes with their own learning challenges. The oldest had a very preventable meltdown this morning and it was entirely due to my snapping at him. The child cannot help that he has processing issues. It is always going to take him longer to accomplish multi step work. It's just a fact of life. I have the eeg's and the MRI that show these issues. He cannot help it. And I need to remember this. He needs me to be the cooler head. To help him break down things into manageable chunks. This will get better as he gets older - part of it is the fact that he has a nine year old brain in an almost 13 year old body. Because when I help him do this he has great success. And he needs success. Public school hurt him a great deal. This was not entirely their fault - I know this child and his issues better than anyone and I still make mistakes there are no hard and fast rules about teaching a child with high functioning autism much less one that has a form of dyslexia to boot. But he had many more failures than successes in public school. They couldn't give him the time or attention he needs and that is no reflection on them. He had some outstanding teachers. He is only too aware that he can't keep up with others his age. I think that contributes to the explosiveness. So I'm restarting the day with a prayer that I am more mindfull of my son's needs. And he's finishing his math and looking forward to the nature walk. This was the year I vowed to be a more organized homeschooler. Thanks to a lot of prayer and Homeschool Tracker Plus it's turned out much easier than I thought it would be. I love to write and have been every since I remember. I write a lot of our unit studies and I contribued to an online ebook last month. I'm excited about this opprotunity to give something back. Be sure to check out HOTM online and be blessed. Since I went off on a tangent rant about 'socialization' in an earlier post and Amy Bayliss said it so much better, I thought I should write about why we homeschool. My husband and I married 'late'. We were not believers at the time and I was pregnant when we married. Shortly after our oldest was born we moved here and we knew no one and I thought nothing of how our little guy was coming along. When he turned 18 months old we decided we needed to go to church. We wound up at a church literally across the street from where we were renting at the time. From the start I should have realized that Oldest has a special connection to God. See, he would sit through the service with nary a peep until it came time for the choir to sing. At that point he would climb up on my or Dh's legs and conduct along with the director. In time. Like he knew what he was doing. He probably did. I don't say this to brag - I am overwhelemed with the privledge God had given me through these kids. They amaze me on a daily basis. As time went on homeschooling tugged at my heart. As Oldest grew closer to school age I started investigating it. Then Middle was born and we moved to our house and then Youngest came along. That was when we started to realize Oldest was not like the other kids. I still remember the color of the carpet in the Doctors office when he told us he had to refer us to TEACCH because he wasn't qualified to make an autism diagnosis. Autism? Huh? Somewhere in the distant part of my brain rang a bell about detached parents and we were not that at all. We were attachment parents all the way. Our son was affectionate. Well I decided there was just no way I could homeschool a child with autism. I just wasn't equipped. God doesn't call the equipped - He equips the called. I am quite slow on the uptake and God knows this. Oldest started public school and it was rough - very very rough. First grade was marginally better thanks to a young energetic teacher who was determined to make it work. Second grade went downhill fast. By the time Oldest entered third grade we knew that Middle was also on the autism spectrum. He was a very quiet anxious child. He did well in Pre K and K but first grade was just horrible. His inexperienced teacher - who was also short handed - could not handle the choas and an unchecked bully made things so bad Middle and Oldest (thanks to third grade year that might as well have not even been attempted) finished the year on homebound. I wanted to pull them out then. DH begged me to try another school. I agreed. The boys started out well at this other school. The class sizes were smaller. Then things begin going downhill fast. We did everything - hours of IEP meetings, FBA's, BIPs that were never followed. I was so stressed out I went to the ER with chest pains at least three times. The school's number on the caller ID sent my blood pressure through the roof. I spent more time at school than I did at home. Then it really all went to hades in a handbasket. Oldest is hyposensitive. This was well documented in his school and medical charts. He had a supreme meltdown at school which resulted in him hitting two teachers, tearing up the library and stomping on the foot of the SRO officer. Despite the fact he tested positive for strep throat the next day he was petitioned to juvenile court. Praise God we had a hearing before a juvenile probabtion officer who 'got' autism. She was shocked that Oldest was there for 'a manifestation of his disability.' (Her words, not mine) The charges were dropped. Meanwhile Middle's stress levels were going up and up. I firmly believe he was being bullied (again - this no tolerance bully thing is a joke). He had a meltdown that resulted in him saying he wished he was dead. Despite the fact that it was not a credible threat of self harm, despite the fact that I call our family therapist the MINUTE I stepped out of the school, Despite the fact that the school had proper release forms signed and could have contacted the therapist themsevles if they indeed thought the treat was credible - they reported me to Social Services charging me with MEDICAL NEGLECT! The Social worker was furious at the school - calling the complaint a waste of her time. (Rightly so, at the time both boys had a peditrician, a pediatric dentist, a neuropsychiatrist, an OT, a SLP (private) to say nothing of their community support workers. Dh was so angry he couldn't talk. I was devastated. Even if the charges were without merit it was an attack on my parenting. I'd done everything but bleed for these kids - worked with the school and they did this to me? I am not saying there are not great public schools. I am not saying all kids should be homeschooled. But mine will not go back unless things change dramatically. And I don't think that they will. Plus, we found we liked having the kids home. We found that it was easier to accomidate their special needs at home. Middle has Central Auditory Processing Disorder as well. School was too noisy and overhwelming for him. Oldest has a form of dyslexia and could barely read. Youngest has one whopper of an ADHHHHHD component to his autism. There are days I find him hard to teach. He would drive a teacher into retirement - easily. And we like to learn along with them. We don't miss the mornings of dragging them out of bed, dreading phone calls all day long, hours of homework every night or spending outrageous amounts of money on the latest school fundraiser. We like seeing that light bulb go on. So for us, for our family, it is the best choice. We do not think it's the right choice for every child or every family. All we ask is that others respect that it is the right choice for ours. Well, why not? I'll be the first to admit that homeschooling is not for every child or every family. Good for them. If you can make it work that's great. Every child is different. But don't patronize me by bemoaning how 'hard it must be to teach the same subjects all day long' and give me fake 'kudos'. First of all it is painfully obvious this person was not interested in learning just why any of us homeschool. My friend - and others of us - happily replied that it was no chore - we love it and it's the best thing for our kids. Problems with our local schools - kids with special needs,etc. I have not - since leaving public school and certainly not in college - only been forced to socialize with people within a year of my own chronological age. School socialization is as fake as plastic surgery. It's also brutal at times. A person does not have to be bullied and treated like dirt in order to build character. Newsflash... I was weird in public school. My kids are weird. They are wired that way. My husband and the people that do interact with my kids - people from babies to senior citizens - happen to like their kind of weird. My kids are polite, respectful and they don't care about the latest 'my jeans are riding so low you can see my drawers' trends. They don't walk around with a cell phone attached to their head. They don't spend hours texting. They speak clearly in English. Not text lingo. After the experience I had with my kids in this local school system it will be a cold day in the nether regions before I expose them to that kind of 'socialization' again. The school system can continue to use our tax dollars but they can't have our kids. I consider it a small price to pay for my children's self esteem. I was pregnant with my youngest and my other two were two and five. My oldest hadn't started K because he was past the cut off date. I had overslept because I hadn't slept well the night before. DH called and told me to see if I could find out anymore because he'd heard a plane had hit the World Trade Center. Grumpy, I turned on the TV just as the second plane hit the tower. I called him back and then my grandmother. We talked until after both towers collapsed. I didn't cry until the towers went down. It was surreal. Before becoming a Mom I had been a Police Dispatcher. I worked with Police and Fire and Rescue. And when those towers went down I knew the majority of those killed would be men and women like I'd worked with. The kind of people who charge into danger when the rest of us run from it. And it hurt. I remember Donald Rumsfeld pulling people out of the Pentagon and the Secret Service trying to get him to safety. I remember the look on President Bush's face when he was told. Some said it was fear. I saw something else. It was shock then determination. I let the boys watch the live feed rebroadcast on MSNBC for a little while this morning. They need to remember - we must NEVER FORGET! We were attacked for just being us. The United States of America. Freedom isn't free. Other than the front trying to decide if it wants to hang on the coast or move on out to sea that is killing my sinuses, this is has been a nice weekend. It's nice that we have tomorrow to relax and do some light schoolwork and enjoy the rest of the summer. My planning is so much easier this year thanks to Homeschool Tracker Plus. It is easily the best money I've spent on a product and the customer service is outstanding. You get free upgrades for well - ever. I can put in lesson plans - and there are tons of groups with prewritten lesson plans or I can make my own. I can put in chores or appointments. I can log their reading or a video or a field trip. But the thing I love best in being able to enter my books in the library feature. I can do it by ISN number. It's great to be able to see what I have a glance. I'm not an affiliate - just a homeschooler who loves this product. I was blessed to be able to help out with Teacher Book Bags - 4th and Beyond Book Bag for the month of September. I wrote the Ocean Biomes and the Ring of Fire Units along with a few other writers. I can't say enough about Teacher Book Bag Products. They have file folder games and the monthly book bags have a treasure trove of information that can be used in many ways. You can preview the entire book before buying. Hope everyone has a blessed week! Last night I made another Goodwill run and of course brought home more books. :) We have two large bookshelves crammed full - one smaller one full and stacks and stacks all over the house and garage. Once I get the garage cleaned out I am determined to have wall to wall bookshelves there. I read about a private school doing away with their print library and going to digital. 20,000 books - gone. I wanted to cry. I'm sure such an attachment to an inanimate object seems extreme but books have played such happy part of my life that this and the Consumer Product Safety Protection Act (the dumbest law in the history of the dumbest Congress ever elected) make me very protective of the bound book. When I was a child I spent many happy hours wandering the shelves of the public library. I found so many good books that way. I don't remember learning to read - it came as naturally to me as breathing. I was thrilled to have children because I could share all these wonderful books with them. My kids hate to read. They do like to listen so it's read a loud city here. My husband - currently immersed in a Tom Clancy he's re-read countless times - shares my adoration of the written bound word. I think that's one of the reasons I am so drawn to President John Adams. Eyesight failing as he aged, he had his bed moved into his library. Even if he couldn't see to read them - he knew his books were there and that was enough. So keep you Kindle and give me the books. Nothing will replace the feel of a book as far as I'm concerned.